The ELSS Intelligent Portal is an intuitive Web Interface that manages storage of collated data on the 'ELSS Intelligent Portal Cloud'. Information can be collected in a number of various ways ranging from basic manual entry into a web-based Spread Sheet (for Clients with less Automation controlling their LSS), through to full interrogation of the existing LSS Control System and then harvested by our intelligent Interface Modules and transmitted to the cloud. 'Alarm' notifications are forwarded by E-mail and SMS to recipients; 'Events' such as Alarms, pump status changes are logged on the portal for historical reporting. Through an intensive R&D programme and end-user collaboration we have designed a comprehensive yet straightforward viewing platform for all our customers. With on-going development, support and continuing system upgrades we offer a fully future-proofed monitoring and reporting package for the end-user. 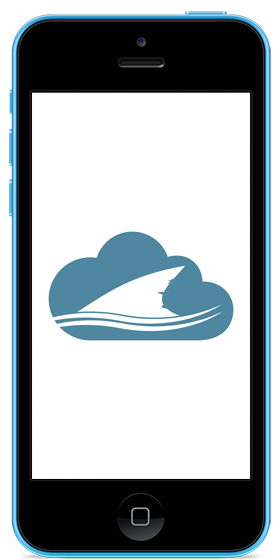 Any of the Water Quality Data for exhibits can be collected, either automatically or manually entered. 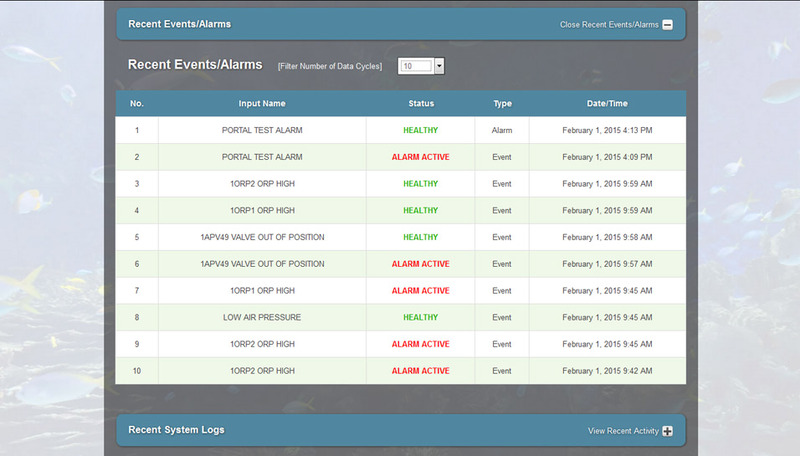 LSS equipment status can be logged, either as an event or alarm condition. Critical readings can be displayed as highly visual clear dial gauges with colored sections to highlight out of tolerance readings. 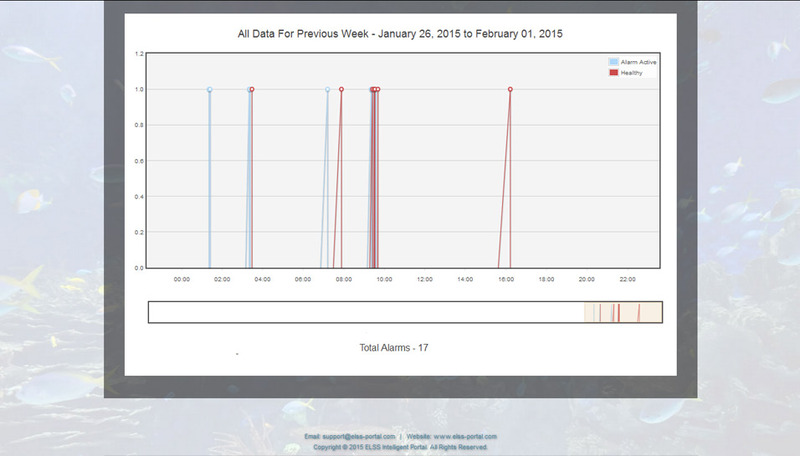 All water Qualities, Power usage, and Water usage logged can be viewed as trends or tabular data. The data can be filtered to display the current data or back into history to track any historical data and/or events. Equipment service history can be logged. For example Pump or UV Lamp running hours. These events can be set to trigger messages for service intervals. Water quality calibration readings can be stored to give a history of Sensor calibrations. Alarms and notifications pertaining to the above are both sent Email and SMS messages. 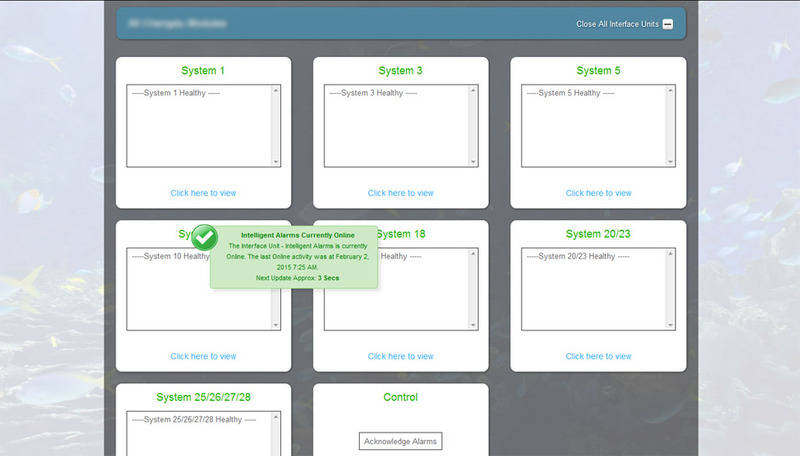 The ELSS Intelligent Portal System will repeat the messages at a user defined interval until the alarm condition has been acknowledged. Water usage can be monitored to detect if an exhibit is using excessive/more than usual water. Costings per unit can be entered into the system to give the water usage as an actual cost. LSS Power demand can be monitored to allow for costs to be allocated to separate exhibits. Changes in power usage can be highlighted and the system can be used to monitor power saving changes for benefits. Costings per unit can be entered into the system to give the water usage as an actual cost. With the proliferation of Smart-Phones and Facility owners, Operators and Maintenance teams being in constant touch through various Web Enables devices, the ELSS Intelligent Portal embraces this and we see the foresee using Email as notification being the "Norm" as we evolve. That said, we still hold traditional tried and tested methods close to our ideology, this is why we have developed the ELSS Intelligent Portal SMS feature using the net to actually generate SMS to any GSM Phone. With a combination of both Email and SMS notification, rest assured that responsible personnel will be in constant touch with the Systems. 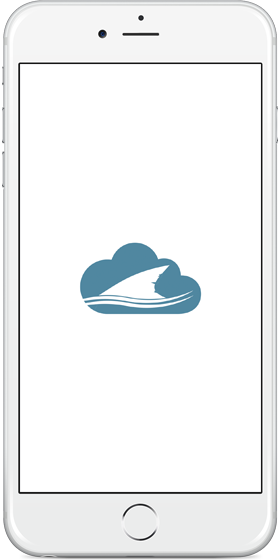 Any of the Water Quality Data for exhibits can be collected, either automatically or manually entered. 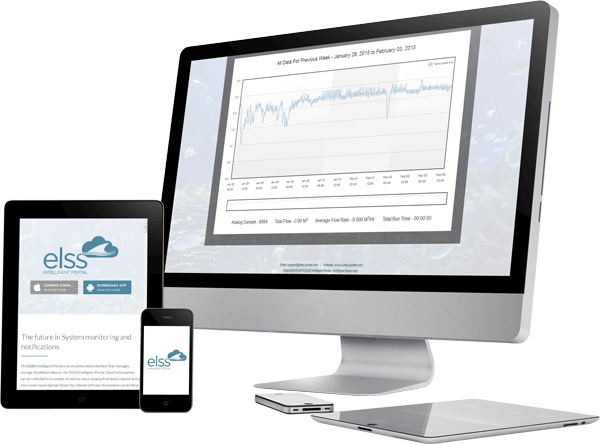 Most Aquarium's now have Parameters such as Temperature, ORP (Redox), pH etc measured electronically, this Data can be gathered and displayed as Graphs and Trends. However, numerous other Water Quality Data such as Nitrate, Nitrite, Ammonia, Salinity etc are for the most part measured manually and then recorded into Spreadsheets and suchlike. The ELSS Intelligent Portal accepts this manual entry, converts and then displays as Trends and Graphs, making it very easy for operators and Lab technicians to spot abnormalities at a glance, without the need to thumb through countless pages of readings in numerical format. Outside of System Alarms, other actions and events can lead to the unthinkable happening. Things such as a critical Pump being accidently switched off may not be an Alarm but could cause other problems. 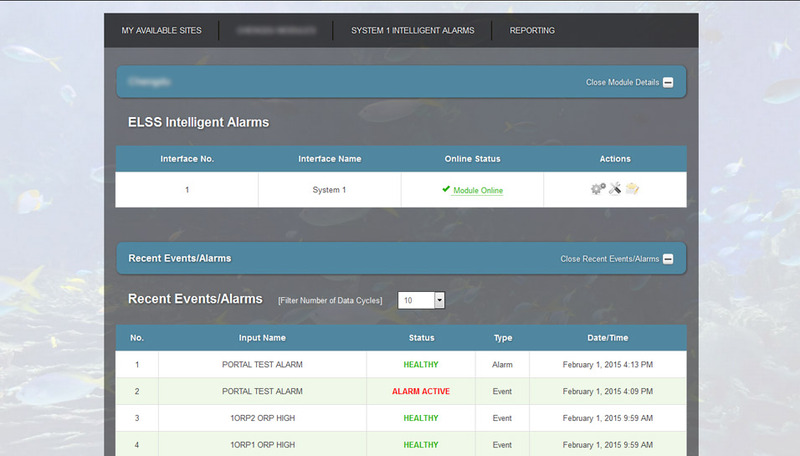 The ELSS Intelligent Portal sends out notifications every time a piece of LSS Equipment changes status. Preventative maintenance is imperative is both prolonging the lifespan of your Systems and reducing the need for knee-jerk reactions to maintenance issues as and when they inevitably happen. With the ELSS Intelligent Portal MRT (Maintenance Recording Tool,) all historical servicing records are easily viewed. This makes scheduling for items such as the servicing of the Mechanical Seals on a Pump seamless. Throughout the years in the Engineering and Technology industry, Gauges have played a pivotal role. They provide at a glance a very clear illustration of "good or not so good!" From Fuel Gauges in Automobiles to Pressure Gauges on Sand Filters, Operators and End Users relay on this simply, but effective technology. Although futuristic in our Engineering approach, we still strive to make our Platform user friendly, and highlight potential problems in very easy to identify way. Again, the ELSS Intelligent Portal puts all Data in an easy to decipher format under one Platform. As with Power, Water costs money. Whether making artificial seawater, or even pumping from the ocean, it has a cost associated with it. The ELSS Intelligent Portal can monitor daily/weekly/monthly usage. This Data can be easily reviewed in conjunction with other information held on the Portal such as, Backwashing events, Nitrate levels etc. Questions like; are we carrying out too many water changes? Do we really have a Nitrate problem? Having all this critical Data in one easy to view platform helps in painting a very clear accurate picture of what is exactly occurring. Tends and Graphs are not unlike Gauges. They provide at a glance an extremely clear picture of the Status of your System as a whole through to analyzing much more finer and in-depth information. The ELSS Intelligent Portal has the ability for operators to run reports, print trends or even save as CSV files. As with Gauges, we like Trends! !